Apr. 10, 2019: Hong Ik Martial Arts has chosen Bronxville as its fifth location, having opened in January at 45 Kraft Avenue, adjacent to the Kraft Avenue parking lot. The school specializes in teaching Korean traditional martial arts. The first Hong Ik Martial Arts was established in 1997 in Tarrytown by Grand Master Yoo, a Korean native who holds a 7th-degree black belt in tae kwon do, a 4th-degree black belt in hapkido, a 4th-degree black belt in kum ye do (swordsmanship), and a 3rd-degree black belt in judo. Other locations followed in New Rochelle and New Jersey. The Bronxville facility is run primarily by Master Seungmin Oh, who holds a 5th-degree black belt in tae kwon do and was a member of the Korean National Tae Kwon Do Demonstration Team. While the physical activity of martial arts is widely regarded as a beneficial form of exercise, Master Yoo touts the practice’s benefits to mental and spiritual health as well. Martial arts reinforce basic principles such as respect, humility, and self-control and help foster skills such as conflict resolution, concentration, and focus. Bronxville was chosen as the newest location to tap into the demographics of both families and retirees. Master Yoo noted that senior citizens have become increasingly active and that martial arts training is also particularly beneficial to children on the autism spectrum. 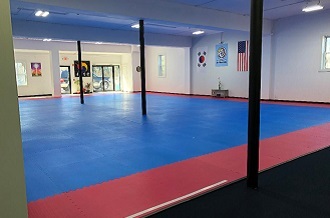 In addition to offering classes for both children and adults, the school hosts 90-minute birthday parties, as well as camp days, which feature an intensive combination of tae kwon do, hapkido, judo, nunchucks, board-breaking, and sword-training and conclude with quiet meditation and reflection. These six-hour camp days are tailored to children, adults, or mixed ages. Weekly classes are divided by age groups: pee-wee (ages 4-6), children (ages 7-12), teen (ages 13-17), and adult. Several family classes are also offered, allowing multiple generations to study together in the same session. The current class schedule features four classes per day plus private sessions. The school is open Monday through Saturday. Master Yoo teaches on Mondays, and Master Oh the other days. Introductory trial rates are available, as noted on the Hong Ik website. Several packages are available, priced at $81. Pictured here: Hong Ik Martial Arts.